Wow, what a show. Well, it wasn’t a show, but instead conservative commentator George Will’s August 14, 2015 Washington Post column, “America’s Barnacled Budget.” All the same, it had stunning twists and amazing drama! Let’s get straight to it, shall we? Last time, George wrote a history of baseball’s union rules from 1974-1979, which has nothing to do with anything. In today’s column, George begins with a lush description of federal funding of whaling museums. One can only imagine the strained lives of bearded whalers battling against the brutal elements to eke out a meager existence, their inspiring struggles chronicled in loving detail by dedicated curators in remote sea-side towns. But George didn’t talk about that. Instead, he deftly shifted to a non-sequitur about mohair subsidies, followed by the sucker-punch revelation that James Madison’s “flinty realism…was too optimistic!” (exclamation point added!)! This surprising turn was gut-wrenching television, except in the form of Pulitzer Prize-winning political column words. These three points—whaling, mohair, and Madison—were then elaborated in a slow-building, intriguing sequence whose tension was only enhanced by the fact that we knew exactly what point he was making. How he manages to invert the rules of normal story-telling and create suspenseful ideological adventures is beyond me, dear TV Recap! readers. In addition, the small emotional moments he manages to sneak in—such as the unassuming scene in which he introduces Jonathan Rauch’s 1994 book “Demosclerosis,” a compelling investigation into the reasons behind governmental inertia—are the work of a master of the small screen which is the cell phone you’re reading his article on. Pay attention, everyone, because this is Chekhov’s proverbial gun, but only better, because you’re inclined to immediately forget any book published twenty-one years ago that has a title that may be a disease of door-to-door salesmen. Just look at this stunning twist! Only after citing Madison’s Federalist No. 10 by quoting a political scientist at a little-known college (ironically called Assumption College—nice little Easter egg there, George!) does the episode—sorry! “opinion column”—quicken the pace. We are thrown into a thrilling and inventive chase, led by this new character (ironically called Weiner—okay, now you’re overdoing the fan service, George) and heading to George (and the rest of us) knows where! Whew! 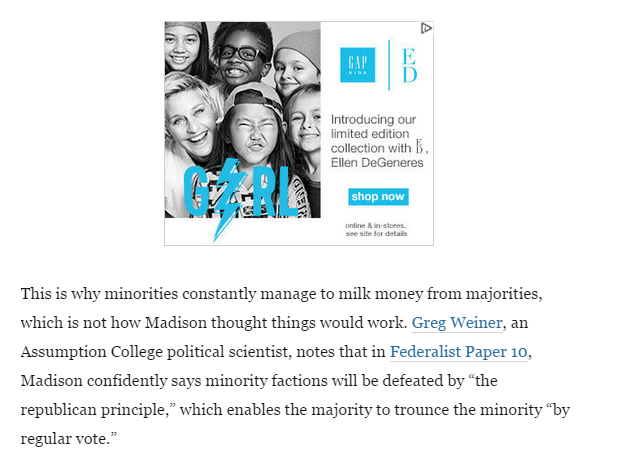 It turns out that Madison’s thoughts about the majority restraining minority factions based on a sprawling multiplicity of balanced interests in a continental republic didn’t account for the dissipation of interests invoked by James Joyce’s Finnegan’s Wake. Wait, whaa? He lost me there. It was such a good story right up until that point. Still, it was a really compelling show. George ends it by giving a name to what we’ve just witnessed: demosclerosis! There it is! I now know that it’s the process of absorbing creaky theories of democracy from a public crank. It’s an important and overlooked message in our society, and I’m glad that George uses the power of his showmanship—really, it’s just entertainment, people—to keep us informed. Just think about what he accomplishes: George Will quotes a Weiner from a place called Assumption to prove his point that whaling museum curators are economic parasites. I wish I had half of his skill, so I could write columns that made twice as much sense. That’s it for now, loyal fans! Next time, we’ll be back to actual TV shows. There’s a new episode of a variety show rerun involving your favorite German-American bandmaster! I have a lot of flinty optimism about that one.